CHOC Children’s is unlike most hospitals. While holistic care is offered at some facilities, no other hospital considers holistic treatments as part of the standard of care like we do. That means that every doctor at CHOC may prescribe these unique treatments to any patient for any need, in addition to traditional medicine. We call this approach “integrative health”—and it means your child’s body, mind and spirit are considered equally important at CHOC. CHOC is the only hospital in the region to offer pediatric-focused integrative health services and we have done so since 2002. Once considered complementary or alternative medicine, techniques ranging from acupuncture to hypnotherapy to massage are now considered standard of care, and are provided by a licensed traditional Chinese medicine practitioner, pediatric psychologists, child life specialists and other pediatrics-trained professionals. These treatments are proven to help relieve symptoms and improve well-being, creating not only a better quality of life for our patients, but a better environment for healing to take place. Integrative health treatments are used to help any symptom that causes discomfort in our patients and their families. Integrative health can be used to help treat a number of health conditions, as well as common symptoms like pain, insomnia, nausea, vomiting, loss of appetite, headaches, stress, anxiety and more. Patients who stay with us at both CHOC Children’s Hospital in Orange and CHOC Children’s at Mission Hospital may be seen by our practitioners under their physician’s supervision. Our practitioners are members of a patient’s care team and communicate with other specialists and staff on the team. Treatments are individually tailored to the specific needs of your child, and are updated to best respond to changes in a patient’s condition. Ask your doctor if it would be appropriate for integrative health treatments to be added to your child’s care. Acupuncture. Acupuncture involves the gentle insertion and stimulation of sterile, single-use disposable needles which are thinner than any used in Western medicine. They are routinely referred to as “cat whiskers” and are well tolerated by children of all ages. These are painlessly inserted at strategic points on the body to relieve pain, stress and anxiety. Learn more about acupuncture. Aromatherapy. Aromatherapy is a treatment which uses specific natural essential oils, purified from plants. These are carefully diffused into the room as an aerosol. They are not applied to skin or clothing. These scents send messages to the brain that can lower stress and alleviate physical symptoms. Learn more about aromatherapy. Biofeedback. This technique uses sensors to measure different body functions such as heart rate and respiration. This information is used to help a child concentrate on changing how their body acts and feels. Learn more about biofeedback therapy. Guided imagery. Guided imagery uses breathing, visual imagery and meditation to help a child find a positive focus and minimize negative thoughts and feelings. Patients learn to imagine a place they find comfort in, such as a grassy soccer field, their favorite beach or a place uniquely safe and peaceful to them. Learn more about guided imagery. Hypnotherapy. Hypnotherapy involves teaching a child how to achieve a state of focused concentration in which they are able to use their mind to bring about comfort and changes in their body. Learn more about hypnotherapy. Massage therapy and Reiki therapy. Massage therapy is a technique that involves gentle manipulation of soft-tissues to achieve relaxation and pain management. We also provide Reiki therapy, a gentle, non-invasive energy balancing treatment. Learn more about massage therapy and Reiki therapy. Pet therapy. Dozens of dogs visit CHOC regularly to interact with patients and minimize their stress and anxiety, provide warmth and comfort, and provide a distraction from pain and the hospital environment. Learn more about pet therapy. Music therapy. Our music therapist uses music to promote better health and encourage a child’s focus on getting better, manage their stress or pain, and provide countless other benefits. Learn more about music therapy. Art therapy. Our art therapy program provides patients an opportunity to engage in activities like finger painting, scrapbooking and taking photos to help them express themselves as well as decrease stress and anxiety. Learn more about art therapy. Seacrest Studios. Our in-house multimedia broadcast center allows our patients to explore the creative realms of radio, television and new media, which has been proven to minimize pain and promote healing. Learn more about Seacrest Studios. Palliative and supportive care. CHOC provides palliative and supportive care to patients and families who are dealing with a serious or life-limiting illness. Learn more about our supportive care services. Traditional Chinese medicine is a non-denominational practice that dates back 3,000 years and remains the foundation of health care in many societies. While there may be some misconceptions about this type of medicine in Western culture, it is actually a well-defined system of medicine governed by standards set by The Joint Commission on Accreditation of Healthcare Organizations. At CHOC, our physicians and nurses trust in the benefits and safety of integrative medicine and offer it in conjunction with traditional treatment, though never in place of it. Dr. McCarty received a doctorate degree in acupuncture and Chinese medicine at Pacific College of Oriental Medicine (PCOM) in San Diego. She completed an internship at PCOM, followed by an internship and certificate of advanced study in pediatrics and internal medicine at Shandong Traditional Chinese Medicine University Hospital in the Shandong Province, Peoples Republic of China. She is a licensed professional acupuncturist with the state of California. In addition to her role on the medical team, Dr. McCarty oversees the CHOC integrative health internship training program for Master of Science students at Southern California University of Health Sciences. If your child is in the hospital and would benefit from traditional Chinese medicine treatment, talk to your doctor about integrating it into your child’s care. For outpatient appointments, contact Ruth McCarty here. Feelings of stress or discomfort can arise unpredictably, and our hope is that patients and families can manage their symptoms in the moment if needed. Through education, recommendations and instructions from discharge, we teach parents and patients how to continue using integrative health techniques on their own. 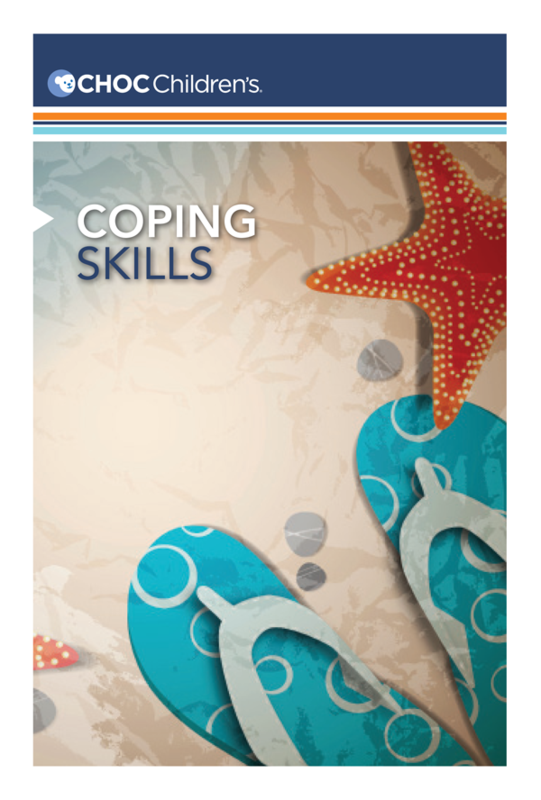 For more helpful instructions on coping skills such as belly breathing, acupressure, self-talk and more, we offer a Coping Skills Kit to guide you. Read the rest of Max’s story. Integrative health services at CHOC are entirely supported by philanthropy. For more information about supporting our program so that patients may continue to receive these important services, please contact the CHOC Children’s Foundation at 714-509-8690 or make a donation today. CHOC Children’s is proud to be selected as a partner with the Orange County Integrative Health Initiative, which is committed to making integrative health services available to Orange County residents, including kids. As the only pediatric-dedicated partner, the CHOC Children’s Primary Care Clinic will be able to offer mind-body therapies, nutrition, and preventatuve health services and more to our patients, in addition to these services currently available in the hospital. The Orange County Integrative Health Initiative is a partnership between the Health Funders Partnership of Orange County, the UC Irvine School of Medicine, the Samueli Foundation, the Susan Samueli Center for Integrative Medicine (SSCIM) and the Coalition of Orange County Community Health Centers. Learn more about the Orange County Integrative Health Initiative.